Situated in the Ras Om El Sid area which lies just one kilometer from the town of Sharm El Sheikh, 2 km from the beach and built around one of the most spectacular swimming pools in town, you will find comfort and enjoyment during your stay at the Tivoli hotel. In addition to the beauty of the location, the hotel's first class service ensures your vacation at the Tivoli will be unforgettable. For dining the hotel Boasts Marrakech Restaurant and for drinks/snacks Palm bar and Pool bar. Other facilities include Gift Shop, Bazaar, Free Shuttle bus to Na'ama bay and to the beach. All the rooms at the hotel are furnished elegantly that include Bed room, Own Shower/WC, Air Conditioning, Mini fridge, SAT TV, Direct Dial Telephone, Balcony /Terrace and Safe box is available at the reception. 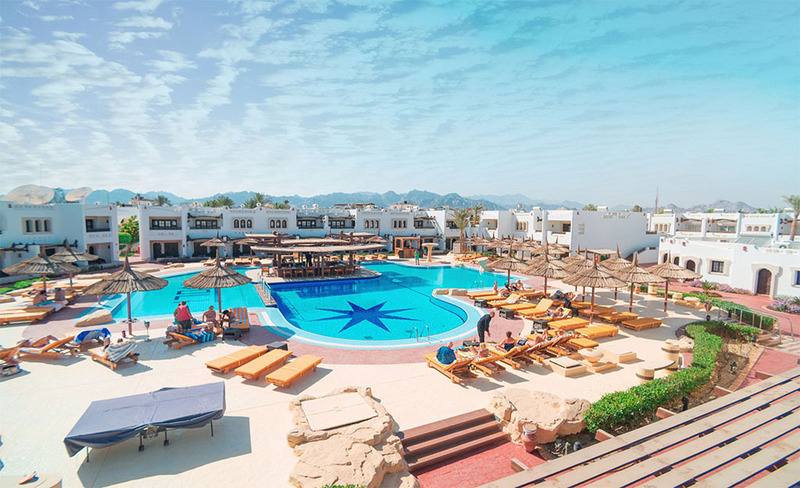 The hotel is only 20 km from the Sharm El Sheikh Airport and 1 km from Sharm El Sheikh town itself.